DEAR TIM: My husband and I live in a one-story home built on a slab. The home was built thirty years ago and we are the fourth owners. A few days ago I heard a bubbling noise coming from one of the floor heating vents. I looked inside the vent and there was standing water! We pumped out water for two hours but the vents filled back up. DEAR LYNN: Oh my goodness. You've got a serious problem or two. Water is in just about every soil to one degree or another. I majored in geology in college and took a deep interest in hydrogeology - the study of groundwater. This sub-surface water can not only cause enormous problems for people who own slabs, but those who have houses on crawlspaces and those built with full basements. Many people who own a slab house think they are immune to problems caused by subsurface water. But I can't begin to tell you how many emails I receive from people who have your identical problem: flooded buried heating and cooling ducts. CLICK HERE to get FREE & FAST BIDS from local contractors who specialize in duct relocation and problems. The problem is happening because water often moves sideways through soil instead of straight down. If you lived in parts of Florida or other parts of the USA where the soil is extremely sandy and drains like water passing through a cooking colander, we'd not be having this conversation. But my guess is that your home is built on soil that has a certain percentage of clay. When rainwater falls onto the ground it readily passes through the topsoil as this upper level of the soil frequently contains lots of air voids. But as you go deeper into clay soils, the soil becomes extremely dense and often water is blocked from going down. The water then starts to move sideways through the soil always flowing downhill and often pops to the surface as a spring. This water is the fuel that creates creeks, streams and rivers. If you look outside your home and imagine the vast amount of soil that might be higher in elevation than your house, you might be amazed to learn that there are hundreds of thousands of gallons of water in the soil much of which is moving directly towards your home. This water can easily find its way under the slab and into the ductwork beneath the slab. It's no wonder the vents filled back up after you pumped them out. Anyone who suffers from subsurface water that is invading any part of a house can stop it in almost all cases by capturing the water outdoors and then redirecting this water to the lowest part of the lot. I've stopped water getting into ducts for decades with my Linear French Drain. CLICK HERE to get a fantastic DVD showing you a DIY install method. Watch this quick video to show you how well the linear french drain in my DVD works! Yes, it's the same drain the spring after it was installed! Think of how gutters work on the roof of a house. Gutters capture the vast amount of water on a roof, channel it to various outlet holes within the gutter and then this water is piped away from the roof. Ideally rainwater from a roof should be piped far away from a house and not be allowed to drop out of downspouts onto simple splash blocks adjacent to a foundation. You can capture the subsurface water by digging a trench around the outside of your home. This trench should be placed about 6 to 8-feet away from the edge of your home. Call 811 first to have any underground utilities marked. Dig this trench 6 inches wide and between 18 to 24 inches deep. The bottom of the trench should be parallel with the soil as it goes around your home. The trench should be extended away from the house and needs to end up at or near the lowest point of elevation on your building lot. CLICK HERE to get FREE & FAST BIDS from local landscapers who might dig your linear french drain trench. As the trench starts away from the house, make the bottom of the trench nearly level. As the ground falls away from the house, the trench will become shallower and eventually the bottom of the trench will be level with the top of the soil. You place a 1 or 2-inch layer of washed 1-inch diameter gravel in the bottom of the trench and then place a 4-inch diameter perforated pipe in the trench. Fill the trench with more 1-inch washed gravel until you are within 1 or 2 inches of the top of the trench. You can place pieces of sod over the gravel. The subsurface water will now pass through the soil and enter the trench. Because it is easier to pass through gravel instead of soil, the water will drop down to the pipe. There it will enter the pipe and be transported rapidly away from your home to the lowest part of your lot. The underside of your slab will never be saturated with water again. If your state has a property disclosure law and the previous owners knew of this serious defect, they may have been obligated to bring this flaw to your attention. You should call the Realtor you used in the transaction to see if there was a property disclosure form that was not given to you. The last house I purchased was sold to me by a liar. He lied about three or four water issues. My father-in-law had a saying about people like this: The mills of the gods grind slowly but thoroughly. You can also stop by your local fire department. Just about every fire department in the nation keeps very good records of each time they leave the station and are asked to put out a fire or help in a situation. If they were ever called to the house to help pump out the vents, you know the previous owner knew there was a problem. Well there is always the possibility your local fire department has mystic extra-sensory-perception powers! Water in buried heating and cooling ducts can cause serious health problems. The water in the ducts can initiate the growth of mold. Each time the heating or cooling system operates, the air moving through the ducts can blast millions of mold spores throughout the house. Although expensive to do, it might be a good idea to investigate the feasibility of moving the ducts into the attic space. The one-time expense may be a great way to protect the health of you and your family. Believe it or not, it may be cheaper to abandon the under-floor ducts and put everything up in the attic. You'll save the cost of the linear french drain and cleaning the ducts out. What's more, if you hire a real pro who knows how to properly size ducts so you have the proper flow into each room and the system maintains static pressure throughout, you could be more comfortable with the new ducts! Naomi, you need to schedule a 15-Minute call with me. Tim, I had this problem too. A combo of foundation sealer (ThoroSeal, their best stuff in a green bag applied 2x, and I used their liquid chemical additive for best results) and replacing the drain tile outside the house (gravel surrounding it was nearly 100% plugged up is what I found out) seems to have finally fixed it. I knew where the water was coming in (roughly) so that helped a bit. There is a company that will seal the duct work from the inside, they may just be local to me but FWIW there may be others out there, and they may be cheaper than relocating the duct work to the attic if their process actually works. The before and after picture on their site look pretty good. On to my current problem: Not only is my duct work in the slab, but the builders routed the heat from the duct work to where the water lines enter near the bathtub to keep the lines from freezing, since the bathroom is along an outside wall. The problem is that heat rises up and melts the winter snow on the roof for the recess / wall cavity the bathtub is in at the very front of the house (more in a bit). The condensation that forms on the interior of the roof then drips down the inside front of the exterior clapboard. It is not a huge problem, but if we have a heavy snow winter, it can lead to water damage because it has been doing this for 20 years now (I never really understood the problem until about a year or 2 ago, and initially thought it was simply a roof leak (new roof done 7 years ago), and for the first 5 years didn't know I even had a problem). Can you think of any way to keep that heat from rising up ? I have a few ideas but won't bounce those off of you as to not bias you. I do need much more attic insulation, but the heat itself travel up the uninsulated stud spaces along the exterior wall. Hi, our pipes were almost frozen this morning so I turned on the bathtub at a trickle placed a bucket in there to catch the water for toilets. We went to church. Hours later the bathtub was over flown and water was running down my heater vent. Ever since the other side of the house the vents are blowing cold air instead of warm. It's below 20s out side. How do we get rid of the water? Do you think it's frozen? There is a crawl space. Who do we call or can we do this ourselves. It's a manufactured home we are renting. Ann, you call the owner first. Then you call a heating serviceman to get heat going again. You tell the owner he's got to do what's necessary so that the pipes don't freeze. NEVER leave a house with water running. What a mistake that was, but I'm sure you realize that now. I closed on my home november 2012. Recently I began noticing my home smelled like stale water and that several of the walls has substantial condensation, and just about all the windows in my home are heavily condensated. I am in the process of having the roof replaced even though my provate home inspector said the roof was oaky and should last me about 5+ years......the roofing company went around the enitre house and the city inspector yesterday they told me they believe that there may be water in the ducts of my home, which is on a slab. where do I begin with this....who do I call to verify this? By the way I live in Michigan. Stick a wet-dry vac hose down the ducts. Turn it on. See what you get out. My friend has a serious water issue in her rented home. I walk in and it feels damp. She knows she's had a problem with water problems in her vents before but I think the owner just sweet talks them too much and she thinks its ok. I was In her room tonight and heard water bubbling and making a lot of noise in her floor vents. What do I do or tell her?! It is not normal. Plumbing vent pipes are supposed to be tilted so any condensation runs eventually to the sewer or septic line. My house is on a concrete slab and lately when it rains, I hear water rushing under the heater vents, but the vents are dry inside. It's starting to make me crazy. What can I do? 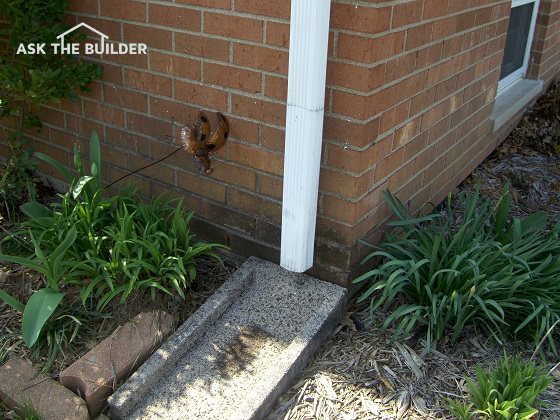 Make sure all downspout water from your roof is piped far away from your home. Be sure NO drainage water is flowing towards your home. Capture it and REDIVERT it with one of my Linear French Drains. 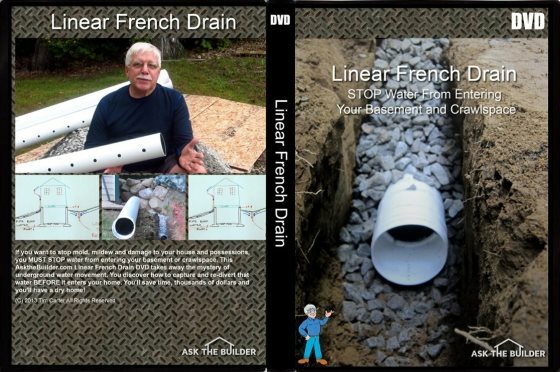 Get my Linear French Drain DVD! I live in a trailer and recently only one of my vents from my heat pump keeps getting water in it. We used a shop vac and sucked out a lot of water but it keeps coming back. You can hear the water dripping into the vent even when the heat pump is not running. What do I need to do to fix this? Please help!! I got a washer earlier and the water rods weren't connected after the washer was placed. I happened to turn the washer on unknowing about the rods and water ran all over the floor for about 5 minutes into my floor air vent. Will this cause any major problems? Tim, I have a house that was built in the 1900s. Last year it seems an artesian well opened up in the basement and now I have continuous running water in my basement. I had to call the fire department and my insurance company only gave me $1500 to fix the problem. I had several contractors in to look at it and none of them had seen that much water. One installed a sub pump and I burned up a few motors because of all the water. Now I have 2 large pumps that run continuously and Jack my electric bill way up. What do you suggest I do? I need to prepare my house to sell, but I can't sell it in this condition. My father told me to just let the bank take it, but I don't want to file bancruptcy. My boyfriend and his family is living in a old trailer everything sounds similar than everybodies problems with water in their floor vent. I'm worried for them. They need a perfessional to come & check it out, the only problem their finance ain't good. What can I do to help them? Tim im glad that you respond to the people very quickly! My problem is that we moved in 2 years ago into a house that is buitk for 20-30 yrs. And the heating vents have water in them, it flooded tye whole laundry room. I put the dryer in the vent to dry out the water but the whole vebt was dried out except water was still running. I dont know if there is a pipe that cracked or some other problem. There is not a lot of soil in our area. I am really stressed abd desperate. Pls help. Thank you! I am currently renting a single story home built in 1962. There is a hill in the backyard and we have been experiencing heavy rains the last few days. I noticed the home has been smelling more "moldy" but last night I heard water sloshing all through-out the house once the heater kicked on and finally after searching frantically I looked down in the floor vent and it was at least 3 to 4 inches of water. After contacting maintenance they said they wouldn't be able to get out until the rain subsides which won't be for another 3 whole days!!! That can't be good, right?! I am really concerned about mold. I have 3 kids and would hate to have to pack up and move. He also said it wouldn't be worth it to use a dry-vac because it would just fill right back up !!! I have water dripping down from all my ac/heat vents. I live in an apt and my vents are right below the ceiling. Is it possible for there to be holes in the duct work? The drain hose from my washer came loose and water drained into the forced air vents, is there a drainage system in a typical forced air vents that would prevent standing water from staying in the vent? Just vacuum it out with a shop vac. I bought a condo unit that is on the ground floor and has heating ducts in the concrete slab. since I moved in 2 years ago, at the end of each November--the heaviest rain month in Seattle and throughout the winter months, I hear gallons of sloshing water in my heating ducts. My condo association is stating this is my problem to fix. But I argue that the water is coming from improper drainage of rain water on the condo property and the condo association needs to pay for the fix. I need a formal report from a reputable company that explains why I have gallons of water in my heating ducts and where the water is coming from. I have called construction companies, but no one will provide me with a written report documenting the problem. Any suggestions about who I can call to get a report? Please help! I am having this exact same problem with my condo. Did you ever get a reply? I can provide reports like this. I just did a phone consult for a woman in the Northwest that had this issue. Purchase this, you send me your address so I can look at your condo on Google Earth and see the terrain, and we go from there. I believe the subject you spoke about is exactly what is happening in our house and would really like to know the type of professional we should call in to fix this. Just to make sure, we too hear trickle of water sipping through our heating vent that is located on the floor on the side of our house. How much is really involved and approx cost you think something like this would cost us. Let say exactly same scenario you described on this blog. Thank you so much in advance. Just desperate to fix this problem. I have links above in the column as to who to call. BE SURE you purchase my DVD and have them install the Linear French Drain as deep as possible. The bottom of the trench needs to be LOWER than the ducts. You may need one of my phone consults first. I own a 2 story, 25 year old house with a full, heated basement. I just noticed water dripping form the heat ducts closes to the gas furnace in the basement. When I pushed up on the duct, a massive amount of water poured out of a small hole in the caulking between two pieces of duct work. What is causing this? How do I fix it? If the ducts are not in the ground, it's condensation. READ all my other columns here about condensation in ducts. You can order a phone consult too. I have read some of these questions however I dont find that any of them help our problem. We recently purchased a wood frame house on a slab. After the second day we heard a rumbling sound. After searching we find that their is water in our vet in the wall. After seeing that we also realized the air does not come out very much. We sucked all the water out and about a month later(currently)the water is back rumbling. We though that maybe the water had been in the vents and this was a one time problem. Apparently not! We are first time home buyers and don't know what our first step is... We also received our water bill and it is almost tripled what we have normally paid at previous rent houses. There is no obvious water leakage. Our floors are fine,no hot spots, no flooded yard. Just the water in the vent. Do we need to hire a plumber or AC man? How can we find out where it is coming from and how it keeps getting in there? We are at a loss....Please help! We just purchased a home on a slab also. When having our ductwork cleaned out, the service person found that the vent in the main bathroom had a large amount of water in it. Could this be from a tub or toilet that overflowed possibly since it is only in 1 vent? Is it possible for water to seep from the ground but only get into 1 duct? He also did find mold in several of the vents which we had treated. 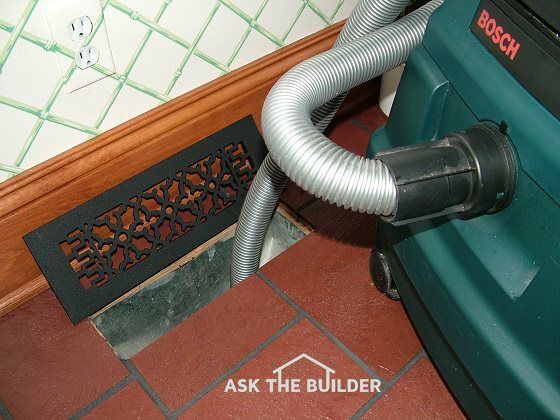 Should we try to vacuum out the vent again with a shop vac and if it continues, install a French drain? The property also has a built in pool in back yard which is surrounded by concrete, making it impossible to put a French drain in there. Finances are very tight at this time also. Any information would be greatly appreciated. Read all my past linear french drain columns. Read all of my mold columns. Read all of my columns that have the keyword phrase "groundwater" in them. One of my Linear French Drains installed CORRECTLY will eliminate the water under the slab. (1) if in-slab vents are abandoned and relocated to the attic, then is water flowing under the slab still a problem (e.g., for the foundation)? In other words, is your post suggesting french drains OR abandoning the in-slab ducts as solutions, but not both together? (2) In theory, would french drains need to go around the whole home, or just the area where the water seems to be entering/pooling in the ducts?